The more we see, the more we loveYou. Isn't this a beautiful image of friendship? 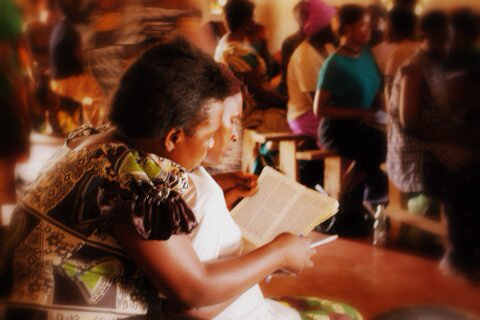 Its one of my favourite Serenje photos, showing two women reading the Bible together. Last night we came together as one church for our Serenje Celebration. Andy and Zoe did a great job in telling the story of the last five years - how we got to be involved, what it entailed, the surprises along the way, and we were privileged to have Jamie Fyleman from Tearfund with us, helping us to see what our future relationship with that community of people in rural Zambia that we've come to know and love as friends looks like. Two things particularly struck me - first, to remember that the pastors and volunteers in Serenje had already identified needs, and had been working hard on the ground, but were praying for a partner to help them. The specific support of financially giving them a "hand up" with seeds, livestock, supporting orphans in schools, and visiting vulnerable people in the community, and indeed the need for a girls dormitory were all identified by them. Secondly, I loved hearing stories of transformed lives - they build our faith don't they? And keep us praying, and cause us to lift our eyes and thank God. Whatever we have done in financially and prayerfully supporting the people of Serenje, it is their hard work, and the Lord who have brought about changed lives - so exciting. And it's not only changed lives in Serenje, we've been changed too - God is good! It's like the line in one of the songs we sang last night King of Wonders. .... "You know the way to our heart, and the more we see, the more we love You". Lord, the more I see you working in my life and others lives, and the more I see transformation and life change, the more I love You. Find out more about the five year project we've been involved in, responding to HIV/AIDS in Serenje, Zambia, and how we can continue to support the work, on the Kerith website.